The Kachemak Bay Writers’ Conference happened this past weekend and I’m taking the day to recover and reflect. This year I didn’t just attend the conference; I really did the conference. I didn’t skip any sessions. I went to the evening readings. I even socialized after hours instead of rushing home to the solitude of my home. I wish I had it in me to write up something cohesive to describe the weekend, but since I’m still feeling whooped and I need to save my writing energy for some revising that needs to be done over the next couple of days, I’ll stick to bullet points. Barry Lopez started things off with an incredible keynote address. He asked the question, “What is the purpose of a writer in a pluralistic society?” Then he wound around to the answer he’s come up with for himself which is that the writer’s job is to help. So that leaves me asking, am I helping anyone or anything in any way? Am I telling stories that need telling? Ann Pancake discussed the tricky territory of writing fiction that delves into political issues. It’s difficult, she said, but when it’s done the right way it has the potential to dispel psychic numbing. I think of The Grapes of Wrath by Steinbeck, a book that I just finished reading for the first time this week. It was relavent when it was written and its relavent today. It’s a book that has helped. Valerie Miner, one of University of Alaska Anchorage’s MFA faculty members, suggests that we are all literary citizens. She offered ideas of how to keep the literary conversation going, one of which was simply to take one another’s writing more seriously. And that’s one of the beautiful things about this conference; writing is shared, discussed, taught and discovered in a supportive, friendly, noncompetitive environment. Warm fuzzies pretty much all around. Peggy Shumaker. Alaska is beyond fortunate to have Peggy as the State Writer Laureate. Her generosity, professionalism and kindness are a blessing. In her closing address she admonished us to look out for one another—and nobody looks out for writers the way Peggy looks out for writers. Back to Barry Lopez. He says to know exactly why you’re writing. It’s necessary to have a solid understanding of your purpose as a base for the rejection you will face. Yikes, but true. This leads me back to the forever question of why do I do this? My answer is forming and changing all the time. He also says that writing is not about intelligence. It’s about telling a memorable story. And for some reason I find that statement incredibly comforting. Then there are the other, non-classroomy things: I got to hear longtime acquaintances from the library read their work at the open mic and in hearing them discovered a side to them I would likely never have known had I not been there. I ran into an old friend—one I hadn’t seen in nearly a decade—and we had the chance to get caught up with each other’s lives. And of course I got to see lots of my MFA cronies. The last thing I’ll mention is the bonfire. It was just what I needed after three days of sitting. The wind died down, the rain held off and the bay was calm. Children of attendees ran around, drinks were shared, stories were swapped and music was played. Amy brought her ukulele, Ed brought a guitar, TJ brought his banjo and I brought my fiddle. Since the three of them are infinitely more musically versatile than I am we were able to play tunes into the night. It was a great convergence of a few things that I love. 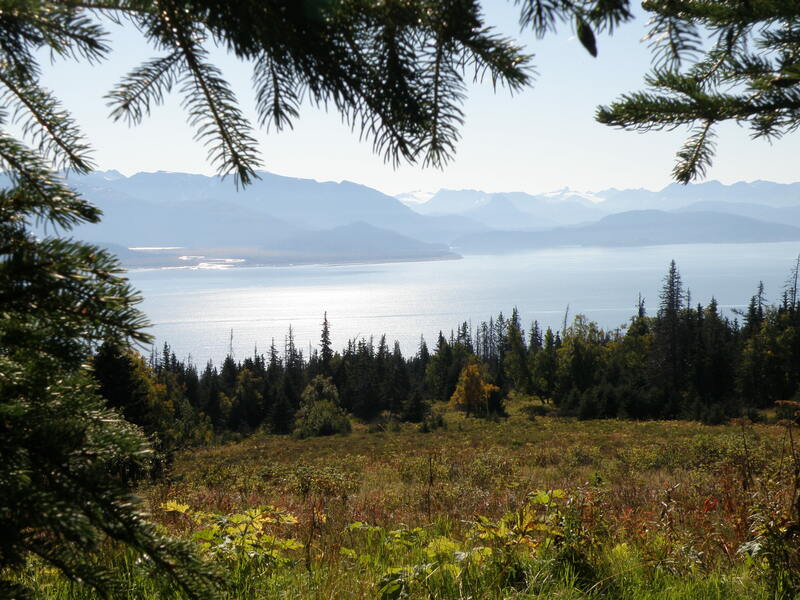 The 2012 Kachemak Bay Writers’ Conference was a great gathering and next year will be too. I mean, Naomi Shihab Nye will be the keynote speaker. Can it get any better than that? Hopefully I’ll see you there. All through September I kept having the feeling that summer couldn’t possibly be over yet. There were a few things that didn’t happen; things that make summer feel complete. This was the first time in the fourteen years that we’ve owned our skiff that we never launched it, which if you live in Homer just seems crazy. 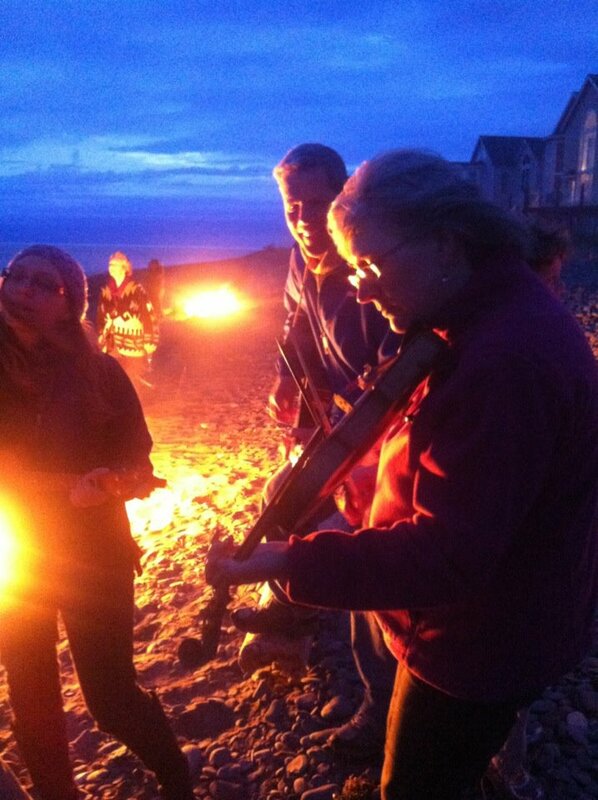 We also never hosted a salmon/halibut barbeque with a campfire. Incomplete as it may seem without those aspects of summer, the even bigger hole in the season comes from the fact that this year there was no Fiddle Camp. And I really, really missed it. In 2005 when I first attended Fiddle Camp I had taken a few Suzuki lessons and had picked out a few Irish tunes on my violin. I knew I loved playing, but didn’t really have much direction, so on my first day of camp I signed up for an Irish fiddle class, a very basic bluegrass workshop and a “how to play in a band” workshop. At the end of the day I was happy enough, I had been challenged and had plenty to work on, but then something happened that night. I witnessed an old-time fiddle jam that changed everything. It was music different than anything I’d ever witnessed. Someone would call a tune and the whole group started to play. Nobody soloed, nobody tried to outdo the next person; everyone just played the same tune together, for a long time. I noticed that after the first five or so times through a tune there was a shift in energy, it became almost meditative for the players, and the music seemed to take on a life of its own. The melody of each tune stayed true throughout, but the driving force was the rhythm. It’s difficult to for me to describe an old time jam, but the word “tribal” comes to mind whenever I try. The next morning I rearranged my schedule to old-time fiddle 1, old-time fiddle 2, clawhammer banjo (even though I’d never held a banjo in my life) and Appalachian singing. My teachers were Kirk Sutphin and Riley Baugus, so it’s safe to say I had a pretty amazing introduction to the genre. I’ve been hooked on old-time music ever since. I play whenever I can; at home, with friends in town, and at festivals. But it’s not quite the same as being at camp. Where else can I immerse myself in music for an entire week, share meals and stay up until all hours of the night with friends who share my passion? And really it’s as much about the friends as it is about the music. I’ve gotten used to seeing certain people every August and I missed them this year. I missed singing hits from the eighties with Travis. I missed hearing Eamon sing Irish ballads (and the Bee Gees) at two in the morning. I missed Jay and Brian’s witty banter. I missed everyone and the whole scene, especially the poignancy of Saturday night when nobody wants to go to bed because we all know it will be a whole year before we’re all together again. 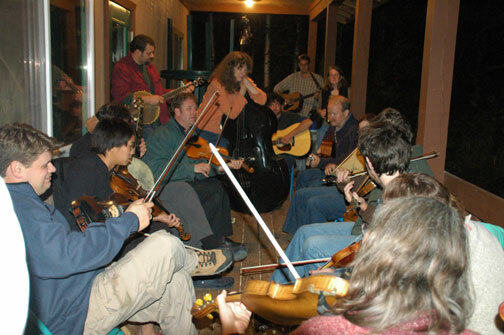 Here’s hoping that Alaska Traditional Music Camp (Fiddle camp for short) will come together again someday. My summer just wasn’t quite the same without it. But even if it’s over, even if I have to get my music fix some other way in summers to come, I’m thankful to have been a part of it for the past five years. It’s blindingly beautiful outside right now. The birch and cottonwood trees are turning yellow; the fireweed stalks are dark pink. The sky is a brilliant blue. Grasses are the deep green of late summer and the water on the bay is calm, punctuated only by the trail of a skiff or a raft of sea birds. It’s almost too nice out there, which sounds strange, but it’s making me feel melancholy. It’s sort of taunting me, reminding me that these nice days are numbered and soon enough it will be winter. And winter is long, and cold, and dark. Soon I’ll have only reminders of summer, like the food the season has provided preserved in the freezer and pantry to be parceled out over the next several months, and the memory of the smell of dirt in the garden and the feel of sun on my skin. I’m not ready to let go of summer. It was too short and I didn’t do nearly as much as I’d hoped to. Yet I know that once winter gets here I’ll be fine. It’s just the transition that seems to be difficult. We’re losing close to five minutes of daylight each day right now, and so this change of seasons doesn’t feel as though it’s sneaking up on me, it feels more like it’s jumping out from behind a wall and hitting me over the head. Recently I’ve been reminded that really life is all about the transitions, and how you get through them seems to say more about the kind of person you are than just about anything else. My grandparents had been married for seventy-three years and still lived together in their own house when my grandmother died unexpectedly early one morning last month. That August day would mark the beginning of a different life for my granddad. Not only had he lost his wife, but he could no longer stay in his own home. Then he sang it through a second time in Spanish. Seasons change, grandparents die and relationships you thought would last sometimes don’t. Children grow independent, parents grow dependent and our best-made plans sometimes get derailed. The transitions can break our hearts or fill us with more joy than we ever thought imaginable. All any of us can really do is try to embrace the changes with a touch of grace and carry around a song or two that will help us get through the hard times. So much more could be said about the Four Corners Folk Festival that Marla and I just attended. It truly was a beautiful event. I would have liked to blog more from the festival grounds, but my laptop battery was limited and in retrospect it was nice to have a couple of days without plugging in. I also didn’t want to be known as the geeky girl, always in front of a computer at one of the most happening parties ever. The highlight of Saturday was attending the late night show at the Pagosa Springs Community Center. We left Ricky Skaggs early in order to acquire a good seat, which turned out to be a good move. The venue was the equivalent of a middle school gymnasium and we were in the third row. First up was a band called MilkDrive. This Austin based group wasn’t one that I’d heard of before the festival, but their musical prowess was impressive. All four of these young men were extremely talented but I must say I had a soft spot for the guitarist Noah Jeffries. The way he looked and played reminded me of my son Dillon. I so wish he could have been there to see the show. After MilkDrive it was time for Crooked Still. Their energy and musical ability created an experience for me that bordered on the spiritual. All of the band members seem like lovely human beings, which added a huge dose of charm to their nearly perfect sound. When I first heard their song Ecstasy several months ago it hit me on a very emotional level, so much so that I listened to it repeatedly for many days. I even dedicated an entire blog post to it. Often times I have trouble finding the words to describe how music makes me feel, and to say that hearing Crooked Still perform Ecstasy live, from the third row of a small venue was the highlight of my weekend is an understatement. I’m not really sure what it is about that song. Perhaps the low cello notes hit me on a cellular level. The Infamous Stringdusters, along with musicians from all of the aforementioned bands wrapped up the evening around 1:00 AM. They took to the stage in a variety of combinations; four banjos, five mandolins, three guitars to name just a few. Watching the musicians interact and visually display their awe for one another gave me the sense that I was invited to an intimate party. They all seemed to be having a fabulous time. One of the problems of being an aspiring musician is that I sometimes have a hard time just enjoying the work of other musicians without my incessant critical voice making me feel bad for not being as good as them. Somewhere along the way on Saturday night I lost that invalidating voice and accepted the gift the musicians were giving me without any strings of guilt or regret attached. In Kundalini Yoga there is a move called the Ego Eradicator. The term seems to apply in this situation as well. By the end of the evening I felt refreshed and inspired. My ego had been sufficiently snuffed away. By early Sunday evening the official festival line-up was finished, which left us with a night of jamming with our new friends from Paonia and New Mexico. We played until around 2:00 and then found our way back to our tent for a few hours of sleep before the long drive on Tuesday. Sleep did not come easily with the sounds of music and laughter wafting around the festival grounds, and as I tossed and turned I thought of ways to bring some of the experience with me into my real world. It’s never easy to maintain the high after a great festival or a week of fiddle camp, but the friends made along the way, the exposure to new, invigorating music and the tunes that I learn keep me going until the next gathering. It’s addicting for sure, but in a good way. First of all, I can’t imagine a more beautiful setting for a festival. Maybe Homer has vistas as beautiful as Pagosa Springs, Colorado, but I’m certain it couldn’t muster up blue skies and eighty degrees. 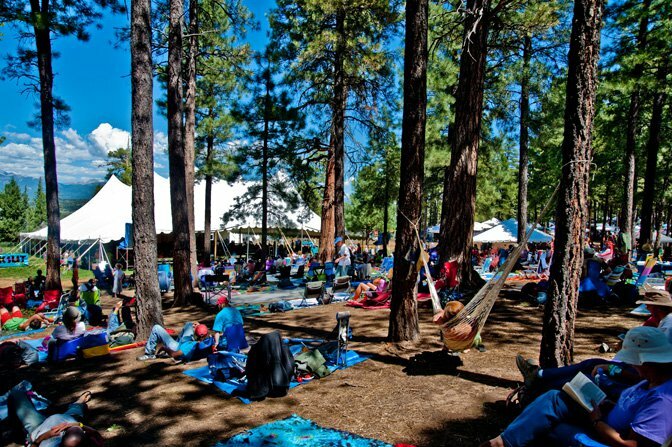 And if you think it sounds too hot, not to worry; the festival grounds are located in a Ponderosa pine forest. Shade and sun abound. Beyond the big, white, open-air tent that houses the stage, a panoramic view of the San Juan mountains acts as a frame for the entire scene. Yesterday after setting up our tent we made our way to the meadow, spread out our blanket beneath one of those Ponderosas and enjoyed The Black Lillies, a country, rock, roots band out of Tennessee. For the next band up we moved into the tent (skin was turning pink on this pale Alaskan girl) and gave Frank Solivan & Dirty Kitchen a listen. Frank, an accomplished bluegrass and classical musician, has Alaska ties and in fact came to Homer for one of the Bearfoot Bluegrass camps that Dillon and Adella attended several years ago. The last band of the night kinda blew my socks off. The Infamous Stringdusters, a six man string band, put more energy into their performance than seemed humanly possible. They are young, they are cute and they rocked the house. They managed to stick to traditional bluegrass, add an element of jam-band magic and throw out some phenomenal solos to create something modern sounding, and incredibly fun. Thankfully they play a couple more times over the next couple of days. Festival people know how to have a good time. And they take their festival set-ups seriously. I’ve seen a couple of camp arrangements that are more comfortable than my own home. Marla and I in comparison feel like little orphan girls. Our creature comforts include a back pack tent and a fleece blanket. This morning while the camp next door was frying bacon on their triple-tiered fold up camp kitchen unit, underneath their twenty foot shade tent, while sitting at their picnic table on their deluxe camp chairs next to their pop-up camper, we sat next to our rental car on a couple of rocks and ate our gluten-free sesame bars. I’m not complaining though. I’m happy to be here. Most everyone here is friendly. We met some folks from New Mexico who welcomed us into their fold for a while to enjoy their chairs and the heat from their campfire. And they let us play a few old-time tunes with them as well. We also met someone who went to Alaska Fiddle Camp a few years ago. While we were chatting with him about Alaska two members from the band Hard Pressed out of Paonia, Colorado wandered past, turns out they were at last year’s Anchorage Folk Festival. Most amazingly, the people here are strangely civilized. Last night the whole place was silent by about 1:00 AM. No fireworks, no loud parties, not even any music. I can’t imagine it will be that way again tonight, but who knows? Maybe Colorado people are more sane than Alaskans. What the quiet night meant for me was a good night’s sleep. I woke up well-rested and ready for another day of sun and phenomenal music. On today’s schedule we’ve got more of the Infamous Stringdusters, Crooked Still and Ricky Skaggs & Kentucky Thunder. Right now, at this very moment, I’m sipping my double-shot Americano on my blue fleece blanket, listening to Sweet Sunny South play old-time tunes. There’s not a cloud in sight. On Friday morning Jay sent us on our way armed with some amazing smoked salmon and a warning to watch out for the “knuckle draggers.” It turns out he had taken his family to the Anderson Bluegrass Festival several years before and had almost been run over in his tent by someone who went for a middle-of-the night motorized excursion, after consuming much alcohol no doubt. Jay and his family ended up leaving the festival early. Sherry had also warned us about the festival, saying it was a wild one. Maybe it was the alluring weather forecast that called for clear skies and temperatures in the 80’s, but after taking heed of the warnings of our friends we decided to give Anderson a shot anyhow. We could handle knuckle draggers, or duck out early if we felt so inclined. We stocked up on more groceries than three women could possibly consume over the span of three days and in order to have optimal awareness before the long drive north we stopped at the Modern Dwellers Chocolate Lounge for some drinking chocolate, (like we needed an excuse.) I was looking forward to the drive with two of my favorite ladies, to listening to all the old-time music I liked (something my family doesn’t really appreciate) and getting north of the Alaska Range to where the summertime temperatures get well above what us coastal folks are accustomed to. Honestly, our first impressions of the festival had us a little worried. We didn’t feel like we fit in very well. Not a one of us sports a tattoo or has piercings in unusual places. We didn’t bring a keg or a hula hoop or a dog. We drove around the grounds looking for a place to camp, feeling discouraged by our options until we spotted a group of people who looked a little like us. They were about our age, clothed, and most importantly they were playing stringed instruments rather than a boom box. We found out they were a bluegrass band from Anchorage called Bootleg Brown and they turned out to be great neighbors. I think they appreciated us as well. The group that camped beside them on the other side brought a pig, not the little pet pot-bellied sort, but more of a hog; the kind that would be in a 4-H display at a county fair. We were the neighbors without the pig, which automatically made us more favorable I think. After getting our camp put together we headed over to the main stage. Peter, the birthday boy from the night before, was playing with the old-time string band Lost Dog from Fairbanks. It was a stroke of luck to get there when we did because out of the hundreds of people at the festival they were the only other old-time musicians we ran across all weekend. We took a close look to see who they were so we would know who to track down when we wanted to play tunes later in the evening. Kate is a great friend and a ton of fun to travel with, but I also discovered an added bonus of going to music events with Kate; she knows and remembers the names of musicians from all around the state. It turns out she recognized the band members of Lost Dog; fiddler Thomas Hart, banjo player Pete Bowers, Kim Blair on the mandolin and Ryan Bowers on the bass. While watching Lost Dog on the main stage it hit me that I was as warm as I’d been all summer. It was already late in the day, around 8:00 pm, and the sun was still high in the sky and beating down on my skin. I haven’t spent much time in the interior of Alaska but at that moment I was a convinced there was no place on earth I’d rather be. There were a few people in the crowd I could imagine slipping into “knuckle-dragger” mode later in the evening, but I was willing to give them the benefit of the doubt. For a while we were just a bunch of people reveling in the sunshine, happy to be away from the real world for a little while. Sometimes a person reaches a saturation point. The dampness of this coastal Alaskan summer was beginning to take its toll on my mood. My imagination was stuck on replaying a scene that involved waking up in the morning and seeing blue sky and a yard that could be navigated without getting soaked. I needed some sun and I wasn’t going to get it in Homer. A field trip was in order, so my sister Marla and my friend Kate and I headed north, to the Anderson Bluegrass Festival. There were no guarantees that the weather would be nice in Anderson, but whenever people gather to play music there is different kind of warmth that is created, a kind of heat that is a close second to that which comes from the sun, and I needed some of that as well. Lucky for me the weekend did not disappoint on either front. We left on Thursday afternoon and headed toward Anchorage to stay one night with our friends Jay and Sigrid, host and hostess extraordinaire. They have an enviable way of making people feel right at home the moment you enter their presence (not just their home.) Sigrid attended the play of one of her nieces that evening so we didn’t get to see much of her, but Jay whisked us away to a birthday party of a fellow musician and fiddle player, Peter. Several friends that I’ve made over the past five years of attending Alaska Fiddle Camp were there, and it was great to get to see them, especially since there will be no camp this year. After visiting for a while we found our way to the dining room that had been cleared out to make room for the purpose of playing music. My brain was dull after the drive, and I could feel the beginnings of a headache (I should have known better than to substitute dinner with a mocha,) but thankfully my friend Sherry, another fiddle player, was there with her plethora of tunes, and between her and Peter and George, I enjoyed the luxury of just playing along without having to think too hard. We played until just after midnight (in order to usher Peter into his 40’s) and ended the evening by passing around a gallon of raspberries that George had picked from his yard and given to Peter as a birthday gift. It was raining again as we left the party but it didn’t really matter. I felt content, and warm, and glad to be in Alaska among my friends.